How Can I Permanently Delete Text Messages on Android? Home > Resources > Erase Android > How Can I Permanently Delete Text Messages on Android? How to Delete Duplilcate Contacts from Android Phone At Once? How to Delete Contacts from Samsung Galaxy? How to Delete Everything on Android Phone/Tablet? Summary: To delete text messages on Android phone, this article offers you 2 optional solutions: permanently deleting text messages on Android phone without recovery and simply removing text messages from Android phone. You can choose one of the methods to clear messages on your Android phone according to your needs. For users who are going to sell their Android phone or send their Android phone to repair shop or other places, it is strongly recommended to permanently delete your private data like text messages due to privacy security with the method in Part 1; while for users who only leave your old Android phone at home without further using, you can also take the method in Part 2 to simply delete messages on Android phone with ease. After deciding to buy a brand-new phone, you may consider selling your old Android phone or giving it away. But before that, you have something to do, that is to permanently delete everything from your phone, especially those containing your personal information, like private messages, message attachments, contacts, photos and many more. Well, you may think that's easy! Don't ever think it is just a matter of deleting the unwanted files within the device itself! That's not enough indeed, since such deleted files can be easily recovered as long as you have a professional recovery tool at your hand. So in order to permanently erase text messages from Android phones, you need to turn to a powerful data eraser for help. Here, you can't miss this Android Data Eraser (Windows/Mac) software, which allows you to permanently delete text messages on Android within simple clicks. Aside from text messages, you can also use this software to delete other files from Android, including contacts, music, videos, photos, apps and many more. The files deleted with this software have no chance of being recovered. More importantly, all brands of Android devices can all be supported, including Samsung, HTC, LG, Motorola, Sony, ZTE, Huawei and many more. For Samsung devices, it is compatible with Samsung Galaxy S9+/S9/S8+/S8/S7/S6/S5/S4, Samsung Galaxy Note 8/Note 7/Note 6/Note 5/Note 4, Samsung J3/J3 Pro, Samsung Galaxy A9/A8/A7/A5 and etc. Now, please download the right version on your computer, either Windows PC or Macbook, then follow the steps below to wipe out text messages on Android phone without any chance to be restored. Let's get started. 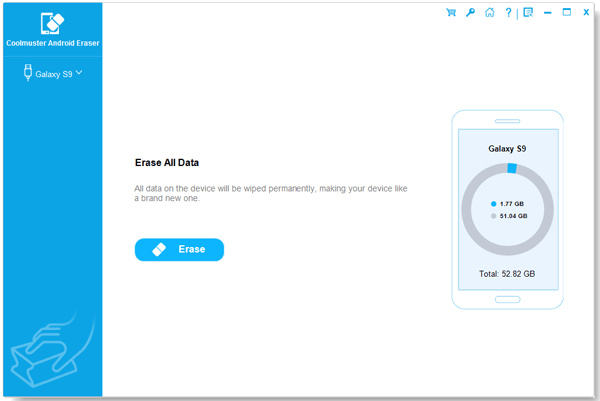 Currently, Android Data Eraser only supports "Erase All Data" mode for Android devices to erase all files from Android phones. This will PERMANENTLY erase all data on Android phone and this action is irrepealable, so please ensure that you have backed up your important data on Android phone in case of unexpected data lost. How to Backup and Restore Android Phone/Tablet on Computer? How to Backup Android Device without Rooting? Step 1. Connect Android phone to computer. After opening the installed software on the computer, get your Android phone connected to the computer via the USB cord. You will be required to install MobileGo connector on your device, just install it, thus this software will be able to detect your device and show the main interface. Step 2. Click Erase All Data mode to erase Android data. After connecting your Android to computer, please click "Erase All Data" button. Before starting erasing your Android data, you need to read the note carefully and confirm your action to permanently delete your Android data by typing "delete" on the box. Before long, you will get a report from the program to show the types and sizes of the deleted data on your Android phone. Thus your text messages along with the other Android data has already deleted successfully without restoration. If you simply want to delete text messages from your Android phone to clear junk messages and free up storage space, having no high requirement for data recoverability, you can directly rely on the Android Assistant (Windows/Mac), which can work as an Android Messages Cleaner to delete all text messages on Android phone with 1 click or selectively delete messages from Android phone with ease. Actually, this Android Assistant is an all-in-one Android Data Manager, which can not only delete text messages on Android phone but also manage (view, add, edit, delete, import, export, backup, restore, etc.) other Android data on PC or Mac. For Android messages, it enables you to view text messages on computer, add and send new messages to your contacts (mass SMS is supported), delete unwanted messages, export messages from Android phone to computer, import messages from computer to Android phone, backup and restore Android messages, etc. Now, please download the Android Assistant on your computer and follow the steps as below to delete SMS on Android phone with clicks. Please make sure you have downloaded the right version of the program on your computer. This tutorial takes Windows version of the program for an example, Mac users can also refer to this guide to delete Android messages on Mac computer as well. Let's get started. Step 1. Make your Android phone detected by the program. After downloading and installing the Android Assistant on your computer, please connect your Android phone to computer via a USB cable. You may be asked to enable USB debugging on your phone with the onscreen prompt to have the program detect your device automatically. Just do it. Step 2. Preview and select text messages on Android phone for deletion. After detecting your device, the program will show you the main interface with your phone information as below. Now, you can click "SMS" option on the left panel to enter the messages section for viewing and selecting. Step 3. Start to delete text messages on Android phone. While previewing the text messages, please selectively tick off the unwanted messages for deleting, or directly check the box on the top to select all messages for deletion. After selection, please click "Delete" button and confirm your action. Thus the selected text messages will be removed from your Android phone immediately. Now, you have two optional ways to delete text messages on your Android phone, please choose your preferable one to clear messages on Android phone. If you have any questions about the softwares or the instructions, please leave it in the comments section below, we will try our best to solve your problems. Thanks for support. How to Transfer SMS from Samsung Galaxy to Computer Effectively?